Would you let your daughter marry this man? I’ve written a little about William Henry O’Connor (1861-1900) before. I’ve since learned a bit more about his life. A somewhat disturbing description. How did he acquire all those scars and lose part of his finger by the age of 20? I don’t know what John Payne was thinking but he gave permission. Their 1885 marriage entry is the last public record to be found for Laura. William managed to stay out of jail but seems to have been down on his luck when he died of opium poisoning on the banks of a creek in Moree in 1900. I’m not sure if this is the same William O’Connor (but I kind of hope it was) who in 1892 was travelling with Samuel Coutts Rinder who was wanted by the police. This O’Connor was described as “a frequenter at billiard rooms and racecourses, and sings comic songs when drunk”. “What’s that gun up there for?” asked the pleasant stranger who had knocked at Tilly Merchant’s door, asking for water. He looked up at the rifle which hung on the wall above his head. While many of us would find it a bit odd for a stranger to knock at the door and ask for a glass of water, it wasn’t so unusual in outback Australia in the 1860s. People rode long distances and often needed a rest along the way and food and water for themselves and their horse. Tilly glanced over his head at the firearm. “Oh, that’s in case Thunderbolt comes”, she replied. Tilly must have been terrified but the gentleman bushranger assured her that he meant her no harm and soon went on his way. Or so the family story goes. Not his best look – a photo taken of Frederick Ward (Captain Thunderbolt) after his death in 1870. Frederick Ward (1835-1870), aka Captain Thunderbolt, was a bushranger who roamed New South Wales in the 1860s. 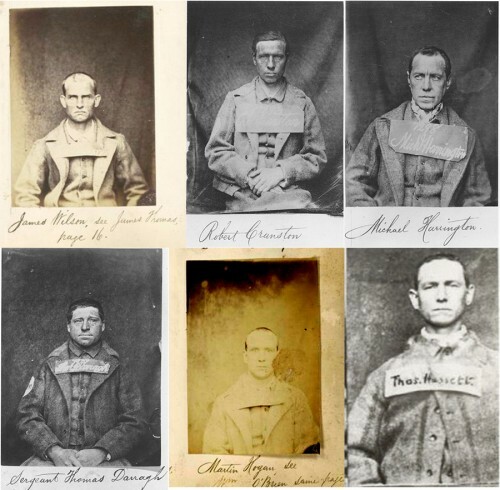 He had originally been sentenced to prison for horse stealing, later escaped the Cockatoo Island prison and remained at large in the New England area for several years. The authorities were searching for him but he seemed to gain the sympathy of many of the people he came across. 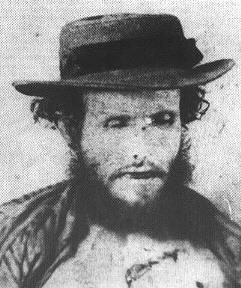 He was known as the “gentleman bushranger” because he was rarely violent in his encounters with people he was robbing. There are reports that he would sometimes attend race meetings and the like but was not “dobbed in” to the police because the ordinary folk protected him. If the story of Tilly is accurate, however, there was still some fear of him in the community. Is the story of Tilly accurate? The timing and the location are right. 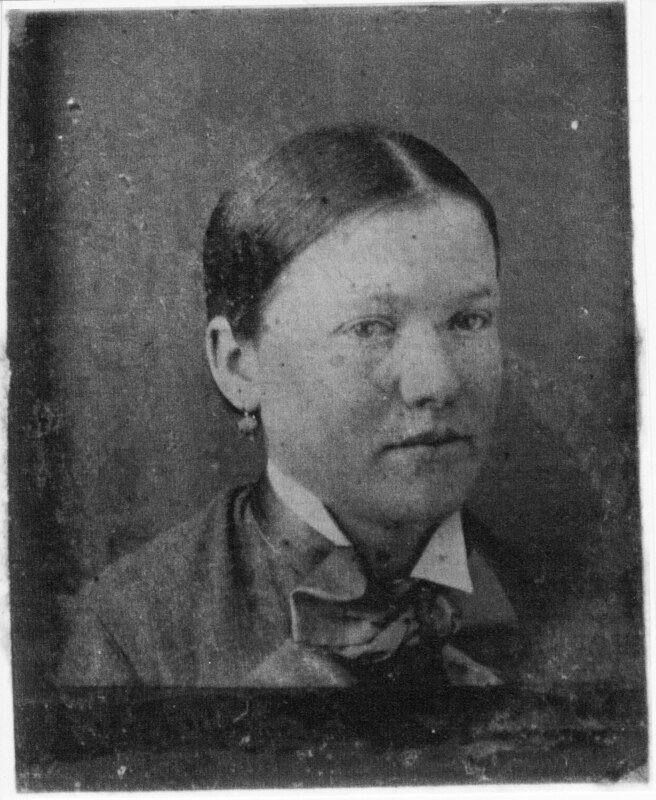 Matilda Elisabeth Merchant (nee Neale) arrived in Australia with her husband in 1855 in pursuit of gold and she lived most of her life in the New England area. Her husband James died in 1865 and she remarried in 1869 to William Collins. 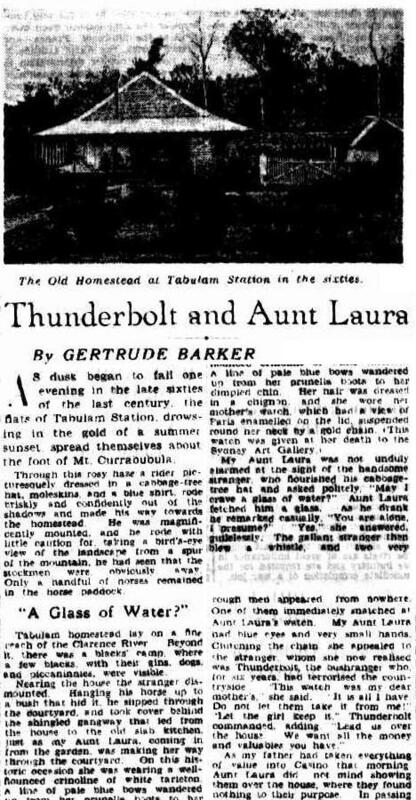 But, what makes me just a little bit sceptical is the number of articles and stories about how people encountered Thunderbolt. Stories from others just seem a bit too similar to Tilly’s story to be coincidence. It was a peculiarity of Thunderbolt’s that he could never rob any one with whom he first entered into conversation; his nature would not permit him; hence his custom was to ride up to a person he intended to rob, and without another word simply demand his money. He pretended never to have known what fear was, and instanced this by telling a story of some gentleman in New England who had made a boast that he would shoot him the first time he met him. A short time after Thunderbolt met the boaster, and saw that he was armed. Boldly riding up to him, the bushranger asked his name, and he told him. He intimated that he knew who he was, adding, “I am Thunderbolt.” The gentleman, he said trembled, and fumbled for his revolver, observing which he cried out “Up with your arms, or I’ll blow your brains out. You were to shoot me; now is my time.” He then took from him his gold watch and a revolver, the gentleman expecting, as a matter of course, to be shot. Thunderbolt, however, assured him of his safety, and rode many miles along with him on his way. My Aunt Laura was not unduly alarmed at the sight of the handsome stranger who flourished his cabbage-tree hat and asked politely “May I have a glass of water?” Aunt Laura fetched him a glass. As he drank he remarked casually “You are alone I presume” “Yes” she answered guilelessly. The gallant stranger than blew a whistle, and two very rough “men” appeared from nowhere. No doubt many people encountered Thunderbolt but I’m not convinced that Tilly was one of them.